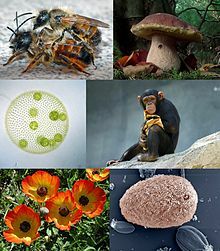 A eukaryote is an organism with complex cells, or a single cell with a complex structures. In these cells the genetic material is organized into chromosomes in the cell nucleus. Eukaryotic cells are usually much bigger than prokaryotes. They can be up to 10 times bigger. Eukaryote cells have many different internal membranes and structures, called organelles. They also have a cytoskeleton. The cytoskeleton is made up of microtubules and microfilaments. Those parts are very important in the cell's shape. Eukaryotic DNA is put in bundles called chromosomes, which are separated by a microtubular spindle during cell division. Most eukaryotes have some sort of sexual reproduction through fertilisation, which prokaryotes do not use. Recent research shows that "the known repertoire of ‘eukaryote-specific’ proteins in Archaea [indicate] that the archaeal host cell already contained many key components that govern eukaryotic cellular complexity". The Eukarya may only be unified in the sense that the cells are a community derived from bacteria and archaea; opinions vary. Like the Protista, the Eukarya may be a polyphyletic assembly, though a useful one. However, as mentioned above, all branches of the Eukarya have sexual reproduction. That, and the general organisation of the nucleus, are the defining features. These two points are the main evidence for monophyletic origin. ↑ Sakaguchi M, Takishita K, Matsumoto T, Hashimoto T, Inagaki Y (July 2009). "Tracing back EFL gene evolution in the cryptomonads-haptophytes assemblage: separate origins of EFL genes in haptophytes, photosynthetic cryptomonads, and goniomonads". Gene 441 (1–2): 126–31. doi:10.1016/j.gene.2008.05.010. PMID 18585873. http://linkinghub.elsevier.com/retrieve/pii/S0378-1119(08)00219-9. ↑ Adl SM, Simpson AG, Lane CE, Lukeš J, Bass D, Bowser SS, Brown MW, Burki F, Dunthorn M, Hampl V, Heiss A, Hoppenrath M, Lara E, Le Gall L, Lynn DH, McManus H, Mitchell EA, Mozley-Stanridge SE, Parfrey LW, Pawlowski J, Rueckert S, Shadwick L, Shadwick L, Schoch CL, Smirnov A, Spiegel FW (September 2012). "The revised classification of eukaryotes" (PDF). The Journal of Eukaryotic Microbiology 59 (5): 429–93. doi:10.1111/j.1550-7408.2012.00644.x. PMC 3483872. PMID 23020233. http://www.paru.cas.cz/docs/documents/93-Adl-JEM-2012.pdf. ↑ Holmes R.K. & Jobling M.G. (1996). Genetics: conjugation. In: Baron's medical microbiology (Baron S. et al. eds.) (4th ed.). Univ of Texas Medical Branch. ISBN 0-9631172-1-1. ↑ Burki F. et al (2007). "Phylogenomics reshuffles the eukaryotic supergroups". PLoS ONE 2 (8): e790. doi:10.1371/journal.pone.0000790. PMC 1949142. PMID 17726520. This page was last changed on 24 January 2019, at 21:37.